In Argentina’s stock market, investment decisions are based mainly on the behavior of the US dollar/Argentine peso exchange rate. Since 2011, Argentina’s government has introduced several measures that have made this possible. As an introductory note, Argentina’s economic history has been dominated by a preference to save money in US dollars (USD). This behavior is a consequence of the high inflation crises that the country has suffered, which in turn, has led to a lack of confidence in the local currency, the Argentine peso (ARS). High inflation periods include the hyperinflation crises of 1975–1976, 1985, and 1989–1990. In these periods, inflation surpassed the 1,000% barrier for the year. The solution for the last period of hyperinflation (1989–1990), as will be explained below, was to anchor the Argentine peso to the US dollar in a one-to-one relationship. Since then, preference for the US dollar has grown. In fact, it is estimated that excluding the Russian population, Argentines hold more US dollars than most of the world. This post is structured as follows. In the first section, I describe the exchange rate policy from 1980 to today. Then, in the next section, I present a deeper analysis of the current exchange rate policy. The third section delves deeper into the core idea of this post — that is, the relationship between the stock market index and exchange rate quote. In the fourth section, I analyze the future of the exchange rate quote and its potential impact in the market. Finally, the last section lists conclusions. To understand the current exchange rate system and its impact on daily investment decisions, it is helpful to go through the different currency regimes that have been present in Argentina since the early 1980’s. June 1982–1990, Crawling Peg: Consisted of a system with a fixed exchange rate, but with periodic (established) devaluations. June 1990–April 1991, Managed Float: Because of a crisis that included hyperinflation and continued loss of international reserves, the government set up a floating exchange rate system but with important controls. 1991–2001, Fixed Exchange Rate and Convertibility Plan: In April 1991, the Argentina Economy Minister implemented the so-called Convertibility Plan, which included a fixed exchange rate pegged to the US dollar in a one-to-one relationship. Under this plan, every Argentine peso circulating in the economy was backed by international reserves. The high interest rate period, together with an undervaluation of the exchange rate, led to an important loss in commercial competitiveness and internal recession, with deflation that lasted until the end of December 2001. 2002–2011, Managed Float: In January 2002, the fixed exchange rate system was abandoned because of a severe financial crisis and political instability, including the resignation of the country’s president. The Central Bank reserves were diminishing rapidly, and the exchange rate rocketed. A few months after the floating exchange rate was established, the exchange rate went from USD1=ARS1 to USD1=ARS3. 2011 to Present, Managed Float But with Strict Controls: Since October 2011, different government agencies have started to implement strict controls on the purchase of foreign currency. First, the Tax Agency (AFIP, for its initials in Spanish) passed a measure that required every person or entity to justify its income sources in order to be able to purchase foreign currency. Then, other measures followed, as will be explained in the next section. Why Impose Restrictions On the Foreign Currency Market? As mentioned in the previous section, since October 2011, the government has had an active role in controlling the exchange rate fluctuations. This involvement was a consequence of the continuous drain of foreign reserves, which was caused by a decrease in the trade balance surplus and an increase in capital flight. 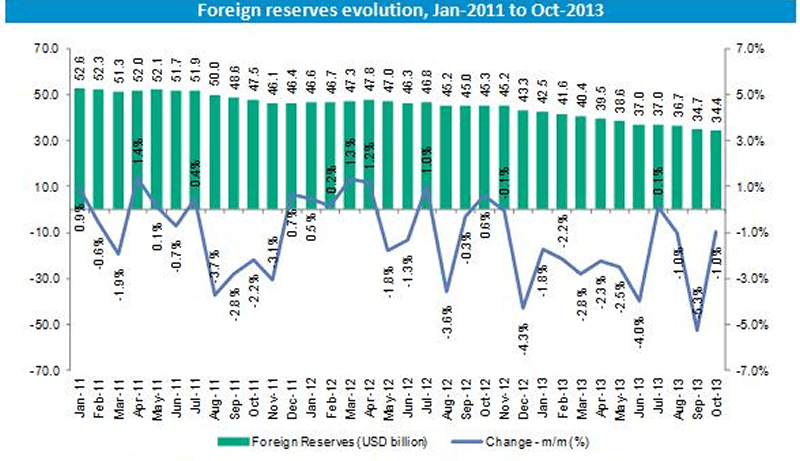 After reaching a maximum level in January 2011, foreign reserves have been falling continuously. In addition, the two months before the restrictions on US dollar demand were put into effect had the biggest decreases in the reserves (3.7% in August and 2.8% in September). It is worth noting that international reserves became an important variable to monitor in March 2012, when the Central Bank law was modified. The main change was introduced through a rule that established a minimum of international reserves that the Board of the Central Bank can set. The reserves that exceed the minimum can be used to pay external debt. By doing this, the board was able to handle this minimum discretionally, and since then, the international reserves have been used to pay the external debt of the national government. Because international reserves have been used to pay debt, the level of these reserves has been falling month over month. Given this behavior, Argentina’s government started to implement measures to stop the drain. First, importing certain goods was restricted, along with other importing restrictions, such as requiring import licenses. Second, the purchase of foreign currency was restricted, which is the policy that will be analyzed more thoroughly in the following sections. Given the strict and increasing controls, other exchange rates, apart from the official exchange rate, have flourished in the market. Mainly, there are two exchange rates that are market based; others can be calculated by using different variables as described in the next table. These different exchange rates have quotations that represent gaps of almost 70% versus the official exchange rate. The following table contains the quotes for these different exchange rates as of 30 September 2013. After the measures taken by the government to restrict the purchase of US dollars, the exchange rate became one of the most influential variables in stock prices as well as in the Argentine stock exchange index, the MERVAL. The correlation between the blue-chip bond swap exchange rate and the MERVAL increased after each of the measures mentioned earlier were implemented. This effect was present not only in the overall index but also when individual stocks were analyzed, especially for stocks that have American depositary receipts (ADRs) trading in US markets. For the complete period since the first measure restricting the US dollar purchases was issued (31 October 2011 to 30 September 2013), the correlation between the MERVAL and the “contado con liqui” exchange rate was close to 0.74. It is worth noting that if we take the same time frame but go backward from the day before the first measure was applied (11 December 2009 to 30 October 2011), the correlation was only 0.38 (total observations for this time frame are 491). As mentioned earlier, the correlation between these two variables increased after each of the foreign currency control measures was implemented. For instance, if we consider the period from when the last measure was implemented (1 July 2013) to the present (30 September 2013), the correlation reached 0.92. When analysis is done on individual stocks, there are some more astonishing results. For example, if we consider the case for Tenaris (Ticker: TS), one of the stocks with more volume traded than other stocks included in the MERVAL, the correlation for the complete period reached 0.97. The following table summarizes the correlations for the most traded stocks that constitute the MERVAL. The period analyzed goes from the date a measure was implemented to 30 September 2013. When the same analysis is done for the period before the first measure was implemented, the correlations between stock prices and the “contado con liqui” exchange rate were not significant, as shown in the following table. What About Company Valuations By Fundamentals? The following table shows the actual prices for the above-listed stocks and their consensus target prices as of 30 September 2012. As you can see, two stocks (TS and YPFD) had negative prospects (because of the estimated decrease in stock price), whereas the others (TECO2, PAMP, GGAL, and BMA) had positive projections for their prices. When the forecasted information is compared with the actual results, it becomes clear that analysts had a more pessimistic view of what actually happened in the market. There was some news that had an impact on these price valuations. One of them was the increasing gap between the official foreign exchange rate and the blue-chip bond swap exchange rate. In the one-year period analyzed (starting 30 September 2012), the increase in the blue-chip bond swap exchange rate was 43.5%, and the gap with the official foreign exchange rate went from 33.9% at that date to 55.7% by 30 September 2013. Even though the increase in this exchange rate may be one of the most important factors in the overall stock price increase, other factors also affected stock prices. For example, a tariff adjustment for services was expected by the market. This tariff adjustment had a positive impact on PAMP’s (energy provider) and TECO2’s (fixed-line telecommunications provider) revenues and hence on the overall company values. In contrast, YPFD was recently nationalized. In the months following that nationalization, the stock suffered an important price cut. But after the main impact of that nationalization was analyzed, the stock price started to recover. Knowing that the US dollar is a variable that is monitored in Argentina in reference to stock trading, the main questions are what will happen with the US dollar quotes and whether there is still room for this correlation to improve. In 2015, there will be presidential elections, and the current president (Cristina Fernández de Kirchner) cannot run again because she has already been president for two consecutive terms. Given this fact, two completely different scenarios can be considered. The first scenario is one in which someone of the same party as the current president is elected. In this scenario, it is expected that there would not be much change in the current status of economic policy (including the restrictions in the foreign currency market and the use of reserves to pay external debt). The second scenario is one in which someone from the opposing parties wins the election. In this case, the expected policy changes would include an accelerated rate of local currency depreciation in order to gain competitiveness that was lost as a result of the lag in the exchange rate. In both scenarios, the exchange rate will keep its accelerating depreciation rate. If correlations remain at the current levels, it is expected that the stock market will follow by increasing, assuming that no more disruptions are introduced into the economy. In this post, I have explained the different monetary and exchange policies in Argentina over the last 20 years, analyzed the measures implemented in the currency market since 2011, and explained the impact of these measures in the local stock market. Finally, I offered brief introductions to possible future scenarios for the country. The main goal of this post was to help you understand how the US dollar quotes affect daily investment decisions in the stock market. Even though the objective of this post is not to give an investment recommendation, the fact that the correlation between the stock market and the US dollar is greater than 0.9 and that the US dollar exchange rate is expected to keep increasing in the coming year may be warning signs to analyze potential stock purchase decisions. Santiago Padua, CFA, serves as COO at Draper Cygnus, a venture capital fund based in Buenos Aires. Before joining Draper Cygnus, he worked as an investment analyst at Grupo Pegasus, a private equity and real estate investment fund; as a senior consultant at Ernst & Young; and as a senior research analyst at Crisil Global Research and Analytics, formerly Crisil Irevna Argentina S.A., all based in Buenos Aires. Padua earned his CFA charter in 2012 and finished his undergraduate studies at Universidad Nacional de Cuyo in Mendoza, Argentina.